We get asked loads of questions by people who are looking to book a band for their big day or big event. Here are a few of the most common ones to take a look at! If you can’t find an answer to the question that you’re looking for, please click the button below to ask a question or if our ‘Live Chat’ is active in the bottom right corner of the screen, please ask away on there. How many of you are in the band? We have four members at a gig. 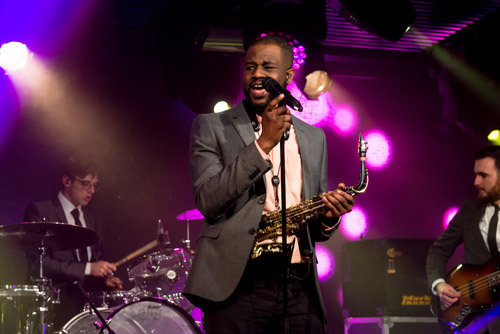 Our lead singer (and Sax Player) is the same for each show and we have a small pool of drummers, guitarists and bassists who are all full-time professional session players and have played with artists including Jools Holland, The Shires, KT Tunstall, Example and Stormzy. Our fees vary from gig to gig, mainly dictated by the date. For example, a peak August Saturday would be at the higher end of the scale and a Wednesday in February would be at the lower simply because of supply and demand. Please complete the quote form to get a price. We operate all over the UK. Currently, we do not perform internationally because of some of our residency commitments. We’re happy for you to choose a few requests from our repertoire but we always pick our set list on the night in order to maximise the amount of your guests and attendees on the dance floor. We don’t have any contractual requirement that you feed us but if you’re able to, we’d really appreciate it. Likewise, some soft drinks would be appreciated but you’re not obliged. We can squeeze pretty much anywhere. Ideally 16x8ft would be great but honesty, we can get anywhere! We’re flexible! When booking, you have the option of paying with our standard 50/50 terms where the deposit is due on booking and then the balance 28 days before the event date. Alternatively, you can take advantage of our 4-stage or monthly payment plans. These are interest free and there’s no credit search so it doesn’t affect your credit score. There is a 1.8% setup charge for payment plans. We play live for two hours and then look after the disco before, between and after our sets. This can be 3x40m, 2x 1hr or 45m and 1hr15m – we prefer and recommend the latter option. We aren’t able to meet beforehand and it’s not really necessary. We do arrange a call with you before the big day though. You will have a designated point of contact with our manager though and they’ll assist you in the day to day management of your booking and get straight back to you with any questions.